I’ve been wanting to check out Sanctuary Bistro in Berkeley since they opened a few weeks ago. I finally had a free day, so I planned a few other east bay activities to partake in before din din. It started with a trip to East Bay Depot where I found some Hello Kitty stationary and a lavender tablecloth for only $6! 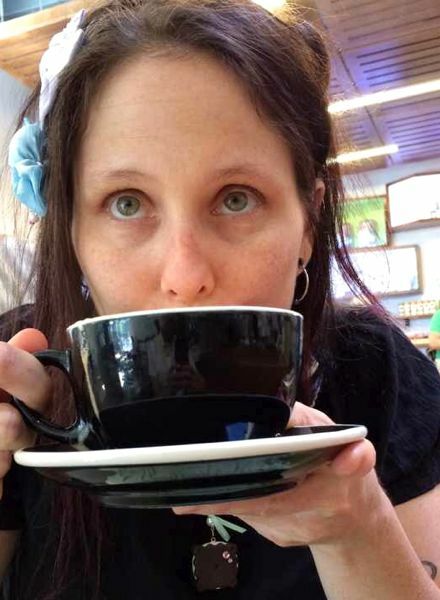 Since we were right next to Sacred Wheel, we stopped in to share a grilled cheese, and learned that now they have quite a few vegan items on the menu. They had a gazpacho, which was a nice alternative to the Pabst Blue Ribbon tomato soup that I usually order to dip my grilled cheese in. Another nice change was that instead of daiya, they now make their grilled cheese with a nut-based cheese that’s quite good. Next was Artis for their famous vanilla almond milk lattes. They make their own vanilla from vanilla beans, so it’s quite a treat. While I was paying for my latte, I noticed a sign near the register that they carry Genuto – a locally made gelato that I recently heard about but haven’t tried yet. When I asked the cashier about it, she informed me that they use it to make vegan affogatos! It was too late for me to change my order and much too late in the day to have 2 coffees, so I’ll have to go back for that. After Artis, we hit up the Crate & Barrel Outlet Store on the same block where I got 6 cute new dishes to match the square white set I currently have from there. Of course, no trip to Berkeley would be complete without a trip to Republic of V. They didn’t have the new cool whip I was looking for, but I did manage to find these new items that I hadn’t tried before. The sea salt chocolate covered caramels were super good! The sausages are a lot different from the field roast breakfast sausages: they’re bigger, they’re saltier, and they taste more like real meat. I think I prefer the field roast ones. When we first got to Sanctuary Bistro, they somehow didn’t have our reservation, and it took them about 5 minutes of looking concerned and worrying us, before they finally agreed to let us stay. 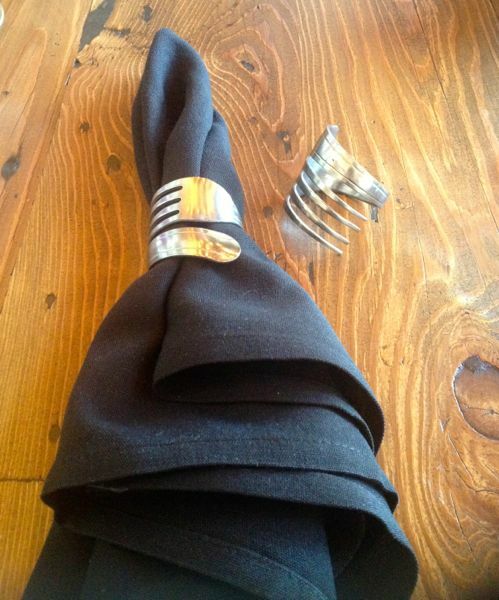 That was kind of annoying, but then when we sat down, they had black napkins in these cute fork napkin rings, so I quickly forgot about the rocky start. For each thing we ordered, I’ll list a description, paste a picture, and give my opinion on how it was. 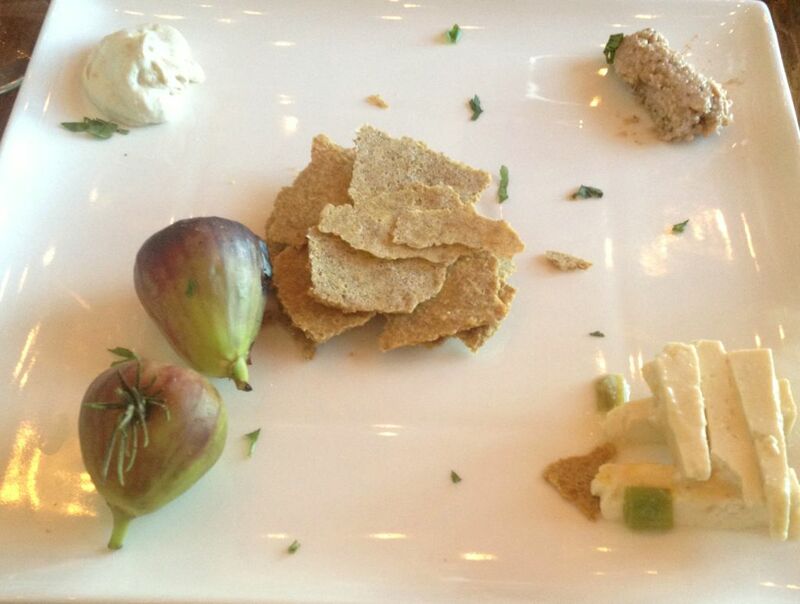 Artisan plate : Flax crackers with cashew chevre, pecan mousse, and citrus tofu, with a side of roasted rosemary figs. I wasn’t a fan. I don’t know what chevre is supposed to taste like since I haven’t eaten cheese in 15 years, and when I did, it certainly wasn’t anything fancy. This cashew cheese was really bland. The good thing about it was its smoothness, which is usually my challenge when I make cashew cheese. The pecan mousse was too sweet for my liking. 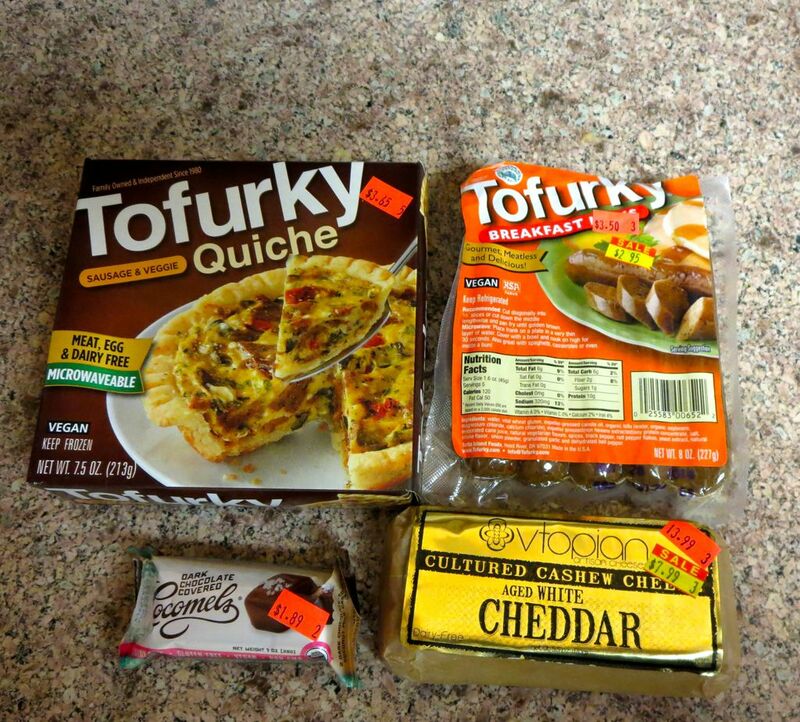 The tofu tasted lemony and was better than the nut cheeses (which is soooo weird, because I usually don’t like tofu). I tasted the fig, and it tasted smoked, which I also wasn’t a fan of. Overall, this was a waste of $14 for me. I’m sorry I didn’t take a picture of this one, but I was kinda starving at this point. Haha. It just looked like a caesar salad, nothing special. I liked the dressing a lot, but the croutons were NOT croutons. They were soggy, and the flavor wasn’t a nice crouton flavor. It was just pieces of tempeh, but when you’re expecting croutons, it’s a grave disappointment. 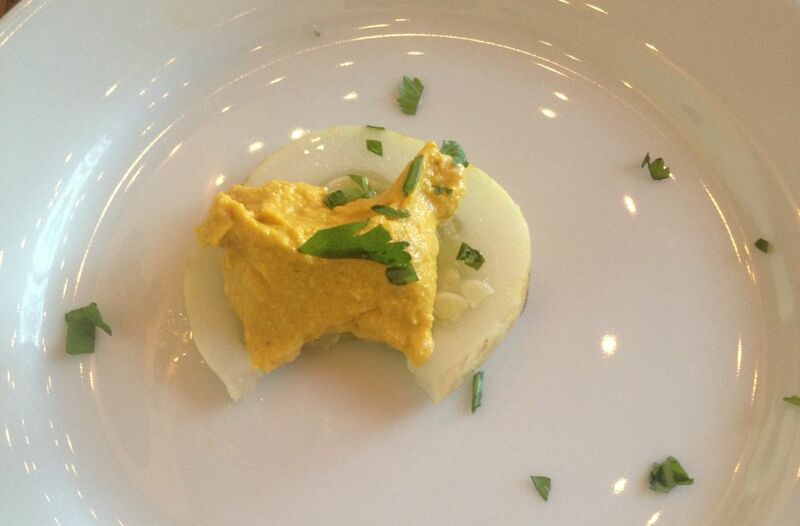 This carrot pâté was really yummy and was my second favorite thing we had. This was given complimentary to all the diners, and probably should be on the menu considering that I liked it more than many of the things we ordered. Also, it was cute to see it served on a cucumber slice, since that was how I served my artichoke pâté that I made a couple of months ago. These were the best thing we ordered. They tasted like they were made with Bulghur Wheat or Kasha. They had oyster mushrooms, as well as a lot of other veggies. 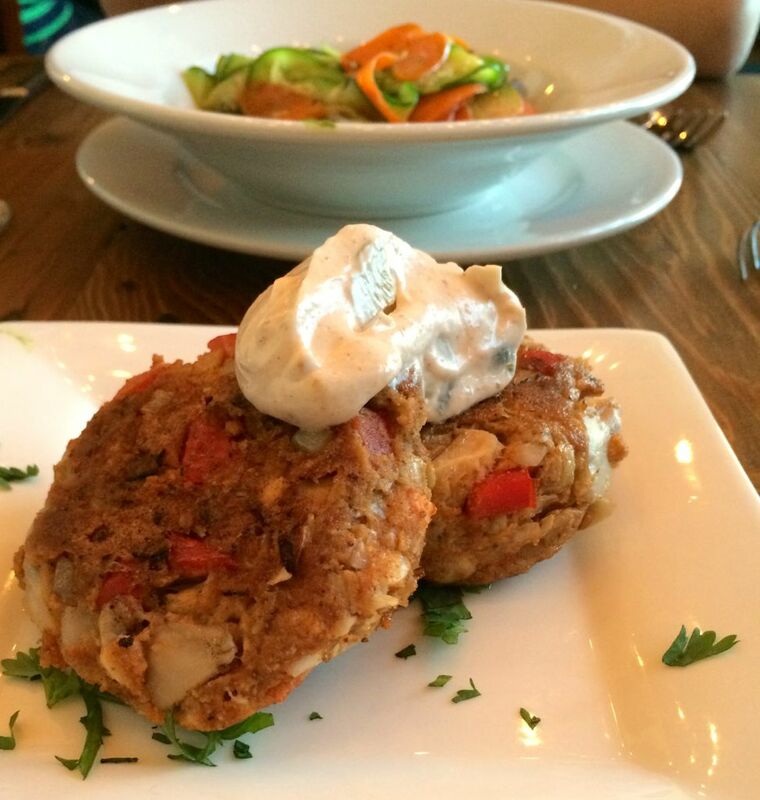 I think I liked the tartar sauce the best. It had a ton of dill in it, which made it super delish. I’m probably going to try to make these at home sometime, but mine will be cuter shapes than circles. 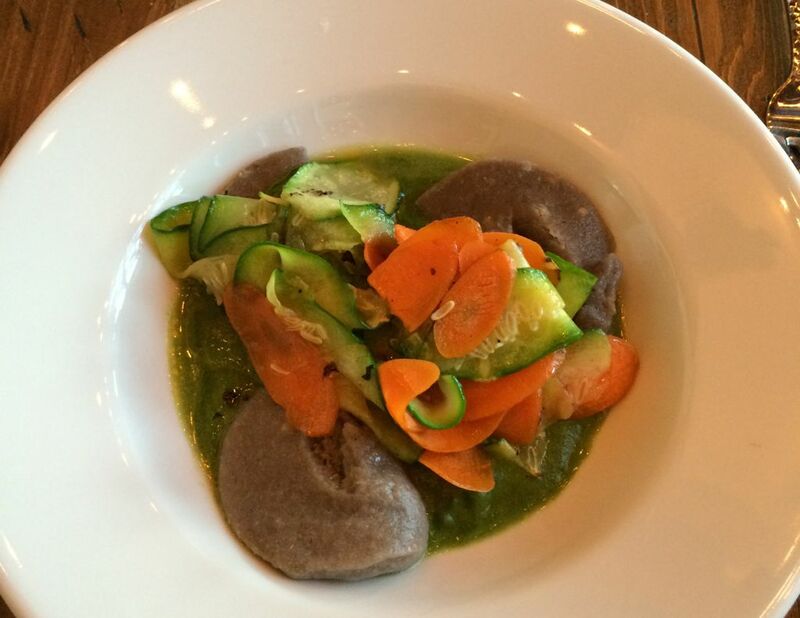 Ravioli : Filled with mushroom duxelle in a spinach cream sauce, topped with braised carrot and zucchini. The flavor of this was good, but the consistency of the ravioli was really weird. It tasted thick and doughy and more like dumplings than ravioli. I’ve been wanting to make my own ravioli, but this was discouraging. It makes me think it’s more difficult than I had imagined, because they most certainly did not nail it. 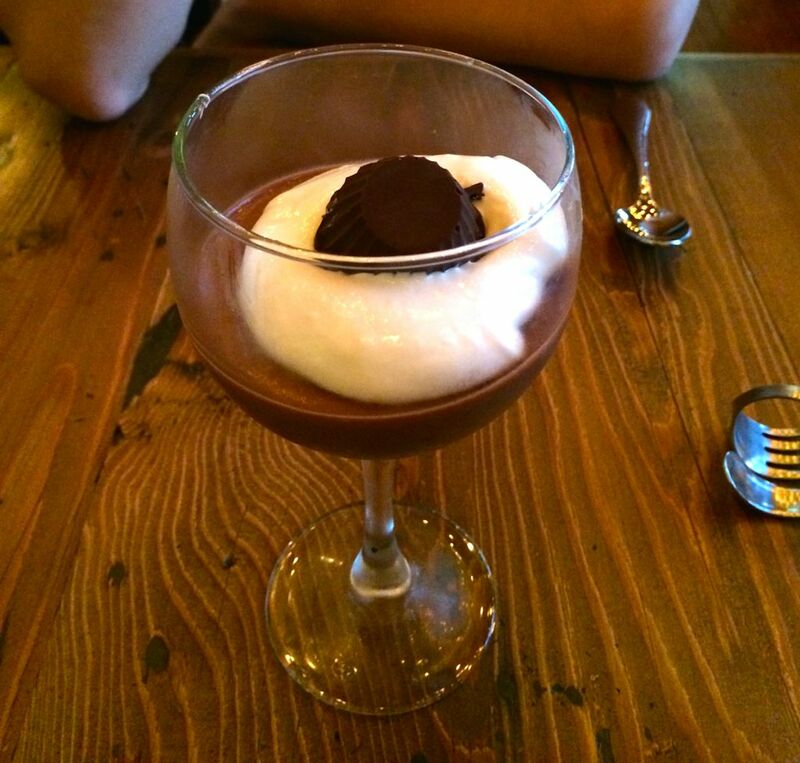 Decadent Chocolate Parfait : Chocolate mousse with coconut whipped cream, topped with a mini almond butter cup. I’m not sure that decadent is the right word to describe this. It was good, don’t get me wrong, but I think the chocolate parfait at veggie grill is more decadent than this was. The mousse was quite light and airy, which is hard to do with vegan mousse in my opinion. The coconut whipped cream tasted like it had lemon zest in it, which was unusual. The almond butter cup was tasty, and similar to the ones I make. In addition to the fiasco we had with our reservation being “lost” and some of the food being less than desirable, there were other strange happenings that made me feel like this restaurant had a curse put on it or something. Not once, but twice, different servers managed to spill water either on themselves or on the poor women dining at the table next to ours. Also, even though our table was the furthest from the kitchen, the noise of dishes clattering was so loud that at a couple points, I almost plugged my ears. I’m not sure what’s going on with the acoustics in that place, but maybe they should turn up the music to drown out the sounds clanking from the kitchen. All in all, I won’t be going back to spend $90 on a subpar dinner. I’d rather spend $30 more and go to Millenium for a fine dining experience that I know I will enjoy, and where I am always treated in very high regard by the staff.